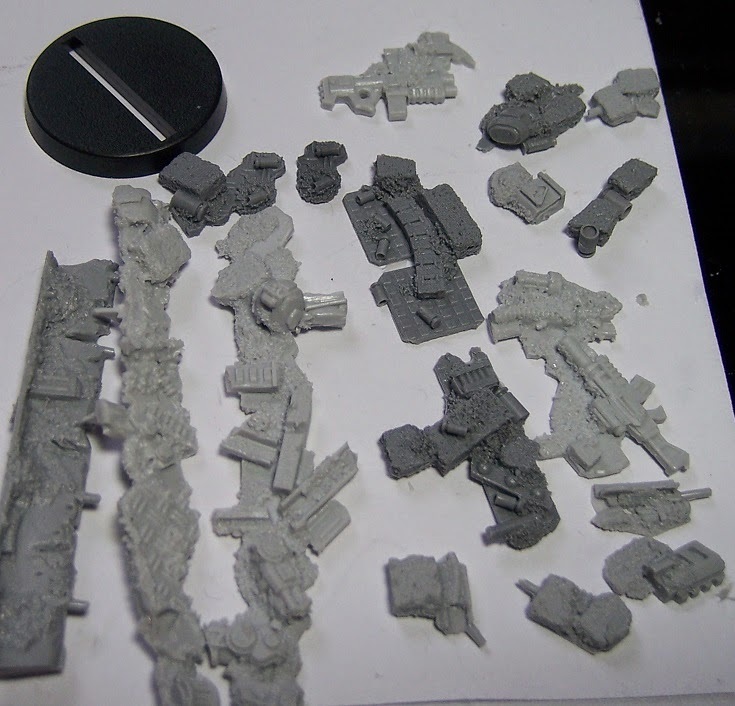 Just got the last few bits and bobs in from Anvil Industry's Afterlife Kickstarter, a project focused on get a new range of near-future, resin minis and skirmish rules started up. Time for another good look at all the rather nifty, new stuff! The actual look of the minis, though of course something that is much more open to personal taste, is also quite something. 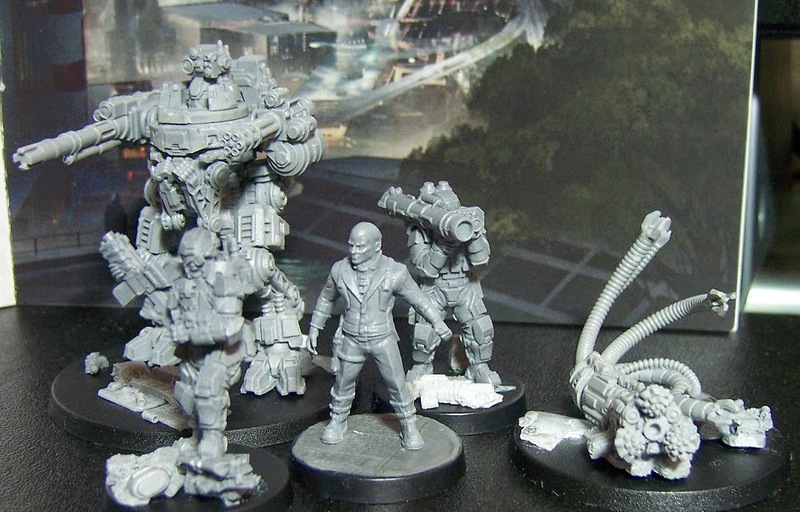 It's rather refreshing to see sci-fi minis that don't fall into the two extremes of either the 'Grimdark, over the top supersoldier'- or the 'clean, borderline manga'-styles of design games like 40K and Infinity are know for. 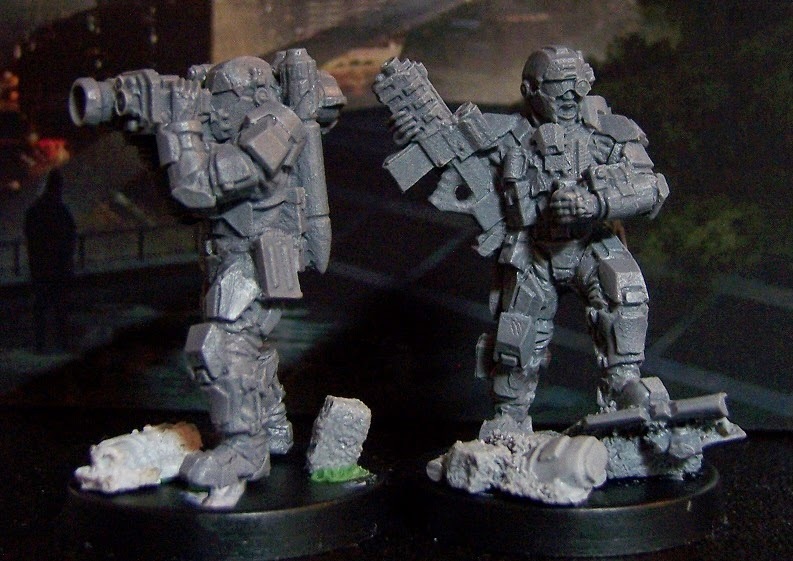 Nothing wrong with those of course, but it's rather nice to see sculpts of machines, soldiers and equipment that have a feeling of real world functionality. The more realism/functional-design approach carries through in a lot of different areas. 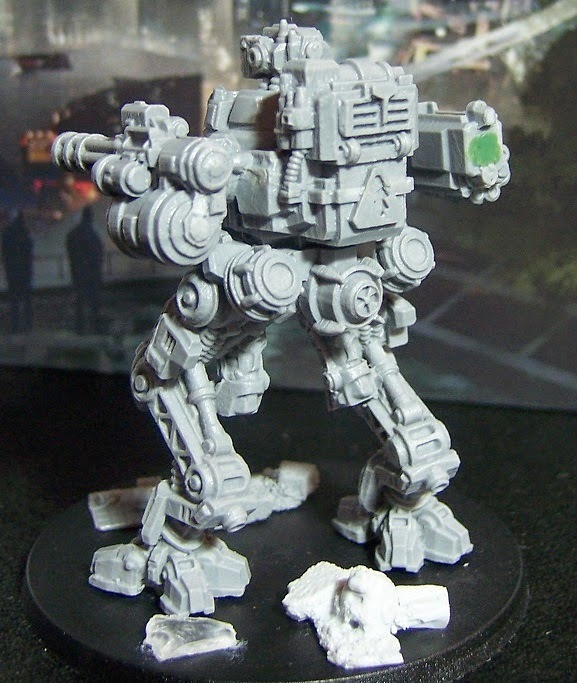 Not only do the various soldiers actually carry enough equipment with them to sustain them during an engagement, the Exo-Mechs are quite in line with current, real drone and suits design for battlefield deployment, they've done all this in such a manner that both, current factions look distinct, yet both technically capable of fulfilling the role the universe attributes to them. I'll go into some more detail about the world and factions of the game further below, but lets just say that their is a very distinct difference between the totalitarian, high-tech Unity Counsil that relies on a deadly combination of firepower, intimidation and infiltration to deal with enemies from outside as well as the more restless portion of their own citizenry. 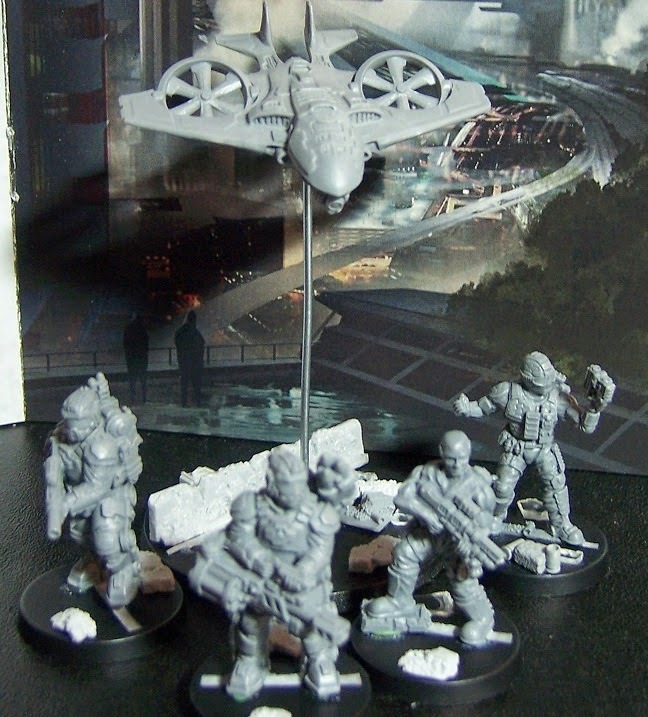 The Pan-Continental Republic, on the other hand, makes much greater use of automated units and heavy-duty firepower in the hopes of leveling the playing field with the Unity Counsil's technologically superior troops. 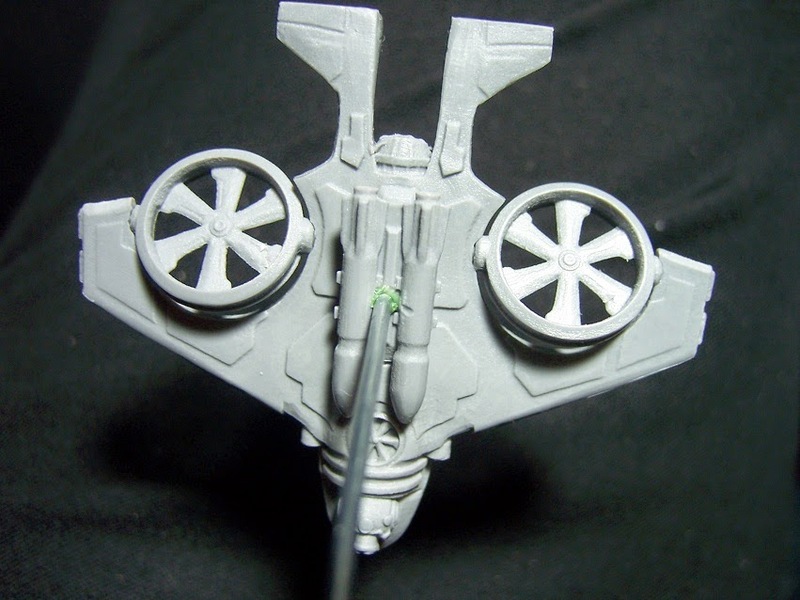 I would even go as far as to say that you can really see how the major power within the PCR, the Radoni Corporation, has designed an army with associated technology specifically to combat the Unity Counsil. 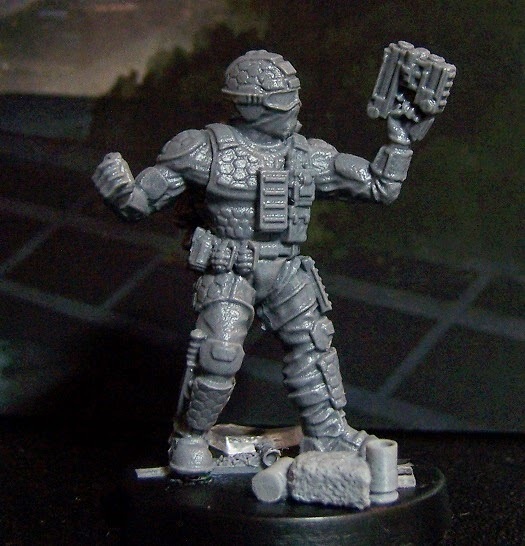 Scale wise we're looking at 28mm semi-heroic proportions, meaning the normal 30-31 mm tall human will fit in great in various other scifi games. However, for the purists out there, it should be noted that Afterlife does for a true-er scale approach than say say GW's Warhammer 40.000. 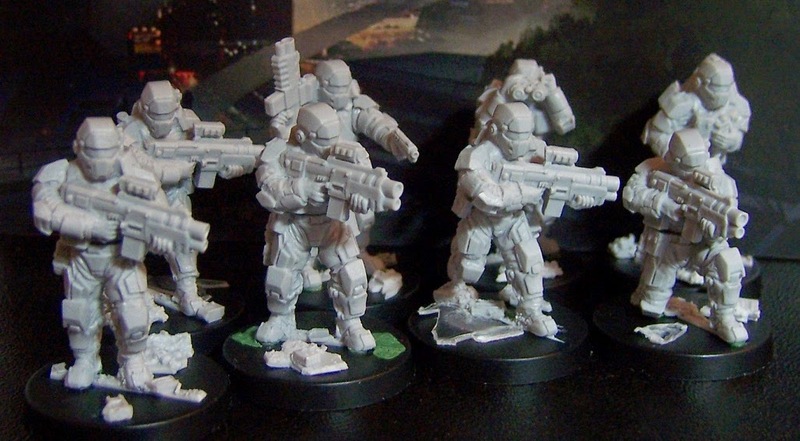 This does mean that a few of the unarmored minis do look a bit more realistically proportioned than, for example, your basic Cadian shocktrooper. 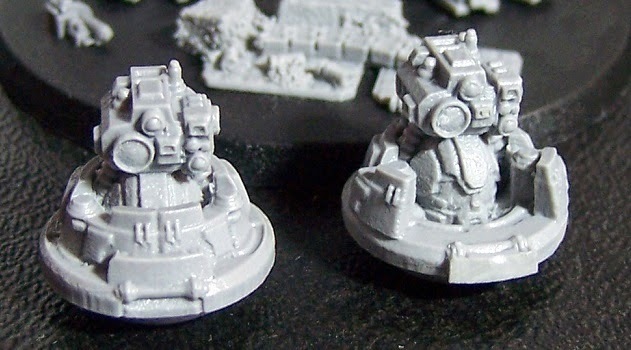 On the other hand, Forge World's own Elysian and Death Korp releases have the same 'problem' of being closer to real proportions than the general GW releases. 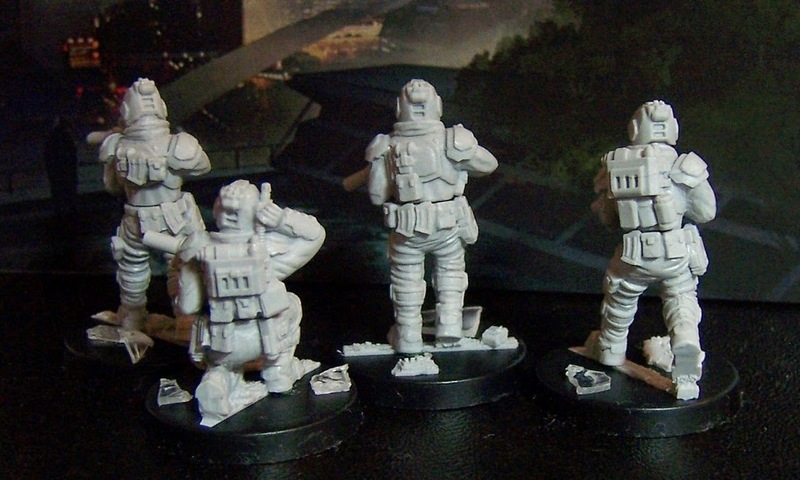 Unity Counsil forces - click picture for a closer look. Pan-Continental Republic forces - click picture for a closer look. 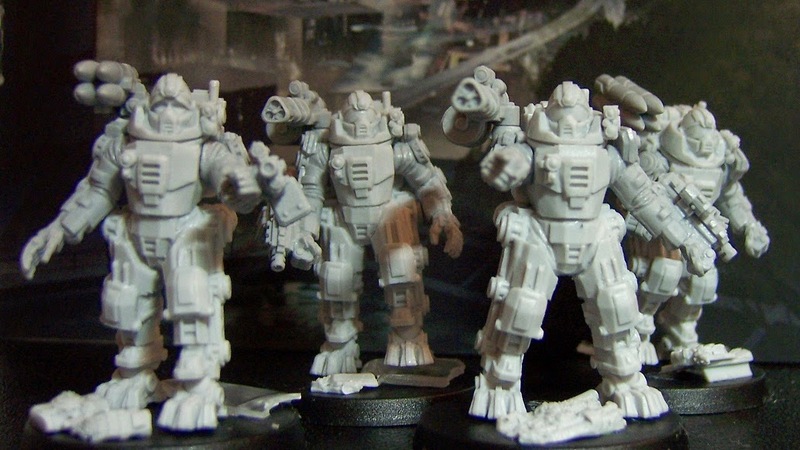 Warhammer 40K / Studio McVey Samaritan scale comparisson- click picture for a closer look. 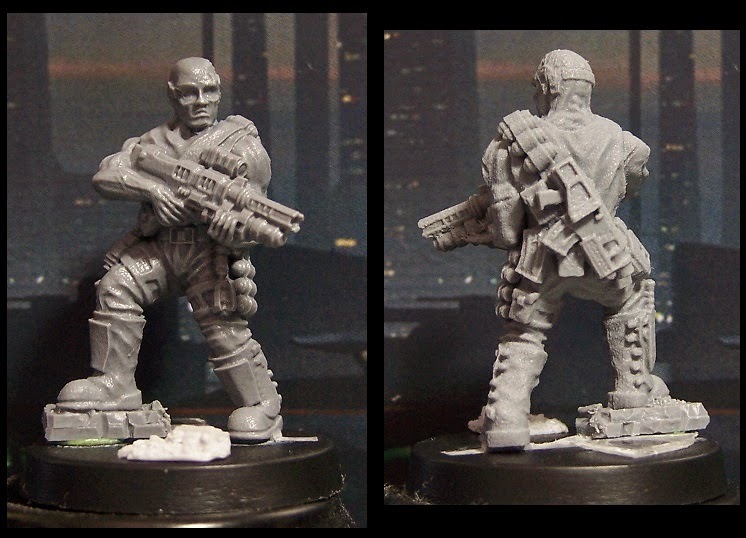 Corvus Belli's Infinity scale comparisson - click picture for a closer look. 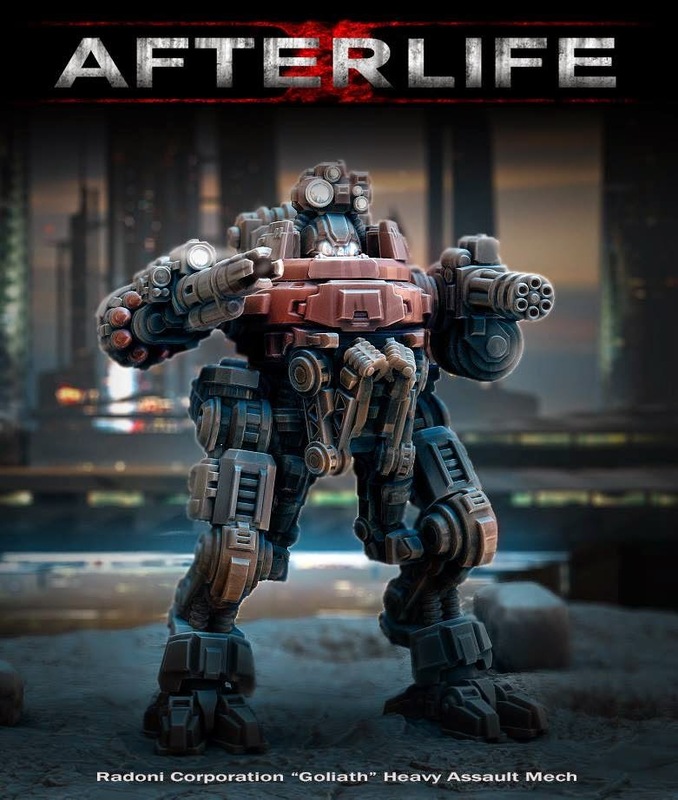 Afterlife takes place in the distant future, near the end of the 21st century where the world has barely recovered from a series of global wars where nations, normal people and corporations nearly ripped the planet apart. Right at the breaking point the head of KronoTec mega-corp, Armand Tennyson rose to power driving a global initiative of unity and cooperation which quickly took root among the regular citizens of the world. In time the Unity Congress was formed, wars slowly ceased and a new global council of democratically chosen members from various walks of life and regions was formed as Tennyson set him focus on the task of rebuilding a fractured world. Buildng mega-cities, developing the Sphere global information and computation super-network and constructing Unity City, designed to house over 300 million people, mankind seemed to be pushing towards a very bright future indeed. But progress comes at a cost, mega-cities are build by millions of workers while the disease prevention and life extension procedures, nicknamed Afterlife technology, have become something only available to the most powerful and wealthy. Not in the least as many of these procedures are less than focused on any lofty ideals such as ethical concerns and donator permission. When Armand Tennyson finally passed away, a full century of his genetically prolonged life devoted to trying to salvage the world, other members of the Unity Council slowly started to make changes to the founding principles, the Articles of Unity. Motivated perhaps both by ideals and greed the UC slowly slid closer and closer to an authoritarian police state in which mega-corporations have effectively become self-sufficient, miniature states. 184 years after its foundation the Unity Council founds itself beset by organized resistance. Which culminated in a young operative effectively leaking a full decade's worth of dirty laundry to the entire world, tossing every filthy secret the Council had been hiding into the living rooms of every family in the world. The subsequent public uproar was mercilessly, and quite bloodily, beaten down by the Council's 'Peace Corps'. Tough still very much in control a 60% of the world, several mega-corps and even entire mega-cities have seceded from the Unity Council, while many of its mega cities are now effectively cut-off from the rest of the world, making them almost independent states. 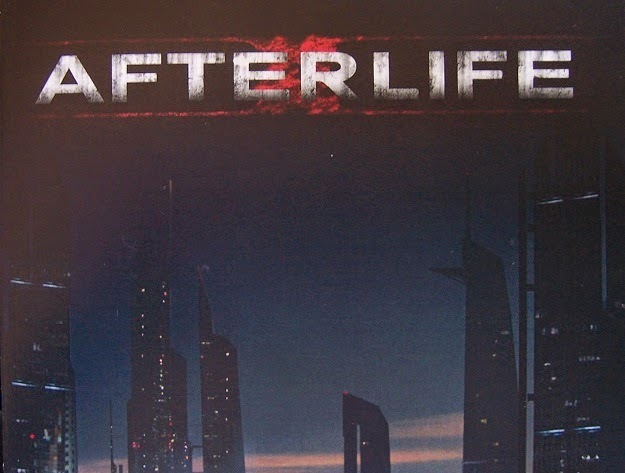 Afterlife's universe is one of a failed dystopian future, in which there is horror, hardship, but also hope.While the Council controls information and resources on a massive scale, it is beset by foes within and without. Not only have many of their seceded former partners, including former Council member and Chief Commercier of the Radoni Corporation Vargo Federici, united in the Pan-Continental Republic. The Council also has to deal with worrying well organized resistance cells in their own territories, as well as mega-corps pushing industrial espionage to a warzone-level. And then, of course, there are the null-zones, lost, abandoned regions of the world who somehow survived the brutalities of the nuclear wars of the 21st century. And what to think of the Sphere network that now controls ever aspect of life in the UC mega-cities, is it truly capable of self-awareness as was hypothesized by its developers? There's quite a lot more to the background, but these are the basics. What's particularly interesting here is how the grand battle for the world isn't focused on territory and pushing huge armies across the battlefield, but rather resources and technology have become the focus of conflict. Borders are mercilessly defended, so conflict is much more focused on tactical strikes, insurrections and good, old-fashioned (industrial) espionage. Combined these elements provide an interesting world that has a ton of potential for further development and interesting, new releases, but also a skirmish-level game that allows you to field highly advances machinery and weapons and gives you a ton of control to build up the story of your unique selection of units. • "Learn by playing" mechanic -basic learning scenarios. • Game Scaling Mechanic - units will have a Battle and Skirmish profile. • Fog of War- To add realism, Units are assumed to be invisible until they are detected by a scan/LoS (bluff element of deployment). • Resource Points - Army lists are not always set in stone before the game, you start with a certain number of resource points which can be used to deploy units to the battlefield, or use special tactics and options such as Artillery Strikes (and other in-game effects). • Command Points - These can be spent each turn to perform heroic actions and special combined actions involving several units acting at the same time. • Faction Building - allowing for dynamic force, using DIY approach to make your own sub-faction. Controlling their territory through a combination of strength, propaganda and surveillance, the Unity Council is now lead by Raul Tennyson, grand-son of the great Armand Tennyson. The upper-tiers of the Council are essentially the most powerful and rich people left in the world, two qualities they will do anything to protect. To this end they employ the privately trained Unity Marine Corp, whose weaponry and exo-mechs are the pinnacle of technological development. Most of this set of models comes in two parts, legs and torsos. There are however three separate heads that can be swapped around for added customization. The Marines Corps also deploy their troops in advanced, light Exo-suits, allowing officers to carrying along more equipment while providing additional protection. 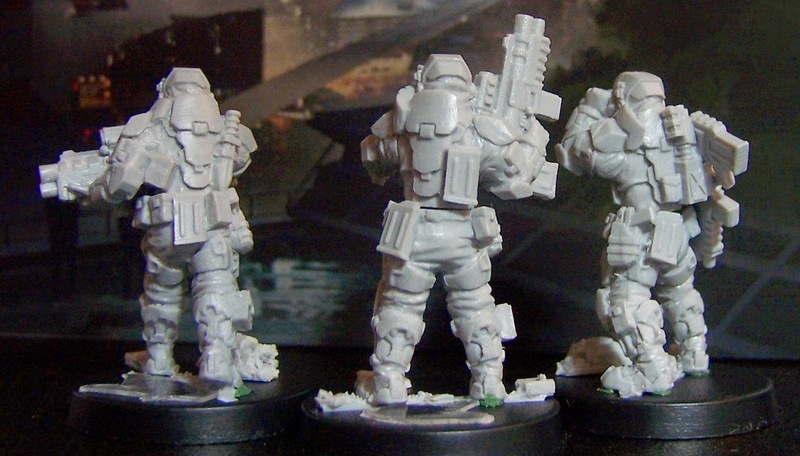 These suits also allow for the quick deployment of heavy duty weaponry. Heavy duty mech support en route! 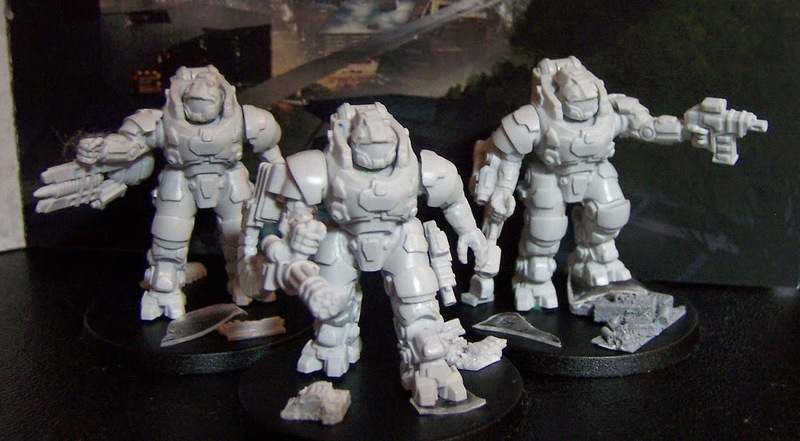 Lovely designs and quite a bit of posability as well, with each model coming with separate heads as well as differently posed versions of all three available, heavy weapons. The Drone may be my favorite model of the lot with its sleek design and movable rotors. Anvil Industry also have a picture up on their Facebook of a Drone with a different weapon mount, might be something for the future. In a world where stealth and espionage are rather important elements of warfare you need a good infiltration unit, which the Specter Operative should be more than capable of filling. 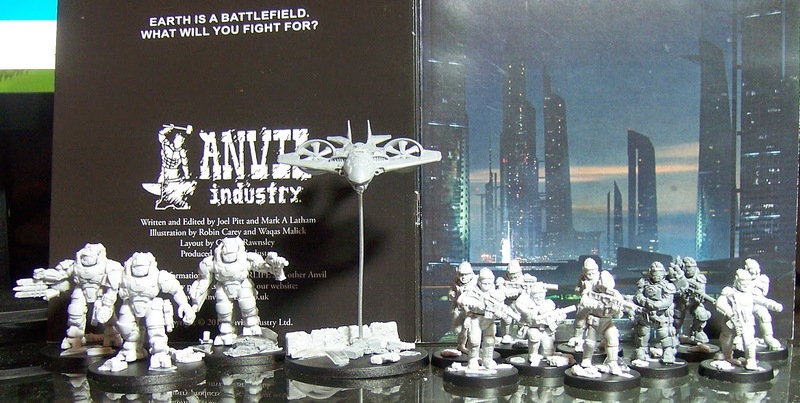 Anvil Industry has also said that in the future we will be seeing a full five-men strong squad of these cool guys. Effectively led by a union of renegade mega-corporations the PCR, particularly thanks to the Randoni Corporation's massive efforts, have managed to turn the initial series of heavy losses against the Unity Council around. 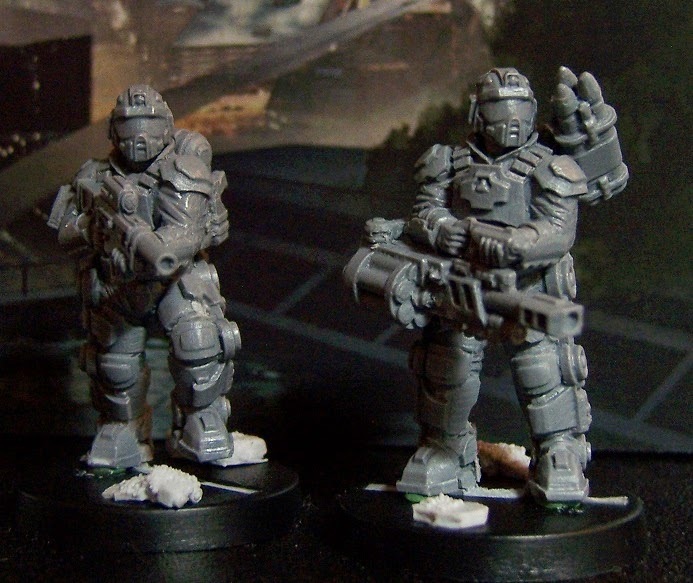 Another set of two-part minis, I really like the combat armor look on these guys. Great potential for both really cool, general scifi troopers, as well as something more sinister. I almost get a G.I.Joe's Cobra feeling from these, I'm rather tempted to get an extra set and give them the B.A.T. treatment (link). The missile trooper and officer should be available for general release soon as well. Five-parters (body, arms & both shoulder-mounted weapon options), the Raiders cannot hope to take an Ajax on one-on-one. But fielded in larger units and with some Gun Tractor support they may be able to level the playing field. The helmet design, more exposed rear and large power plant on their back really give these suits a functional feel. These are suits really look build to fight a specific type of foe, not to intimidate or police civilians. 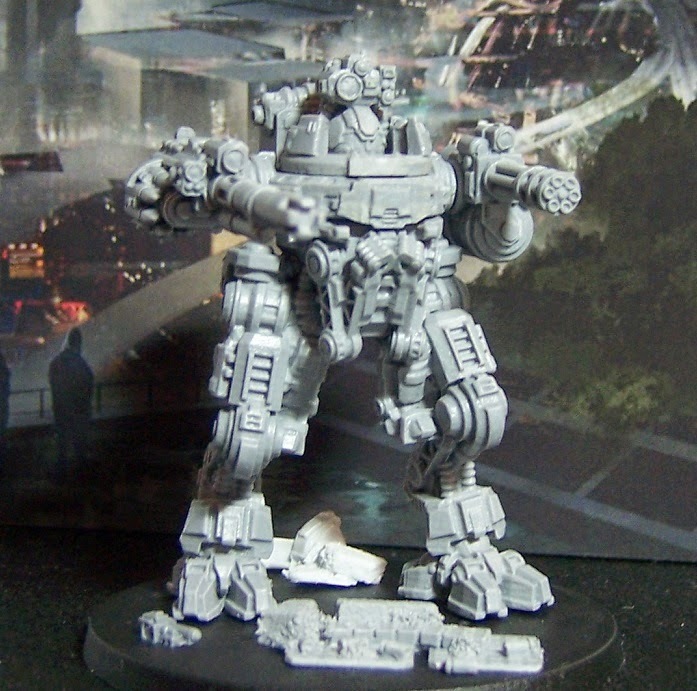 Effectively a small, walking tank, the Goliath has both anti-personnel and anti-armor weaponry available to it. 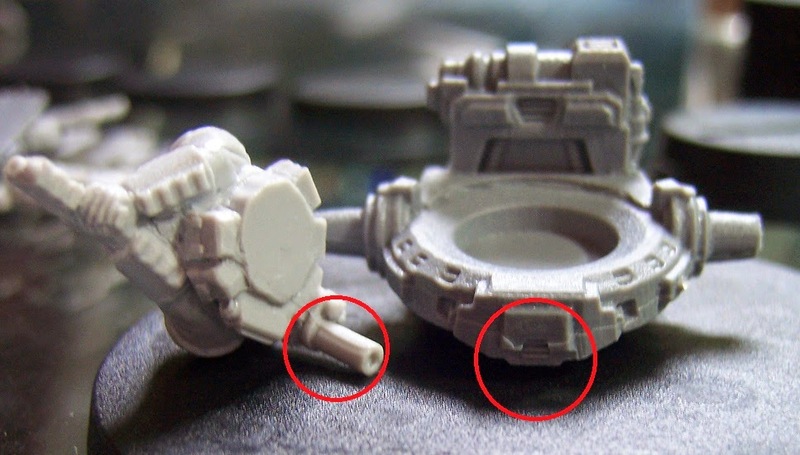 A nice little detail is that you get two 'heads' with the Exo-Mech, a full enclosed and half-exposed variant. 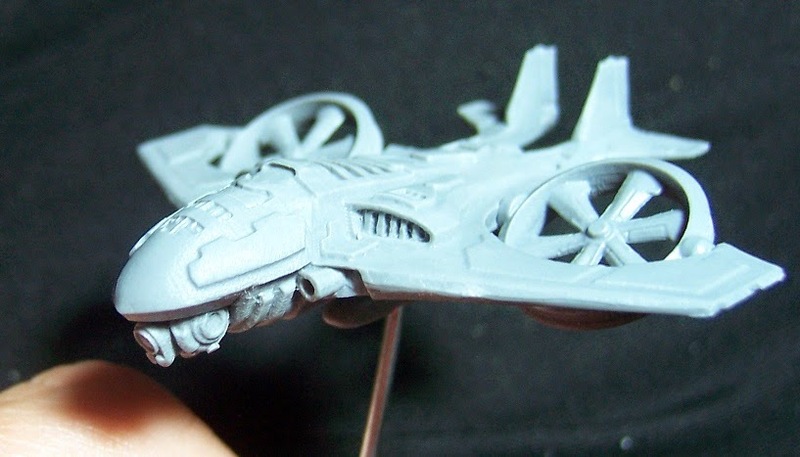 Which naturally meant I had to magnetize the model so I can swap them out! This really is a really nicely detailed model with a great industrial feel. 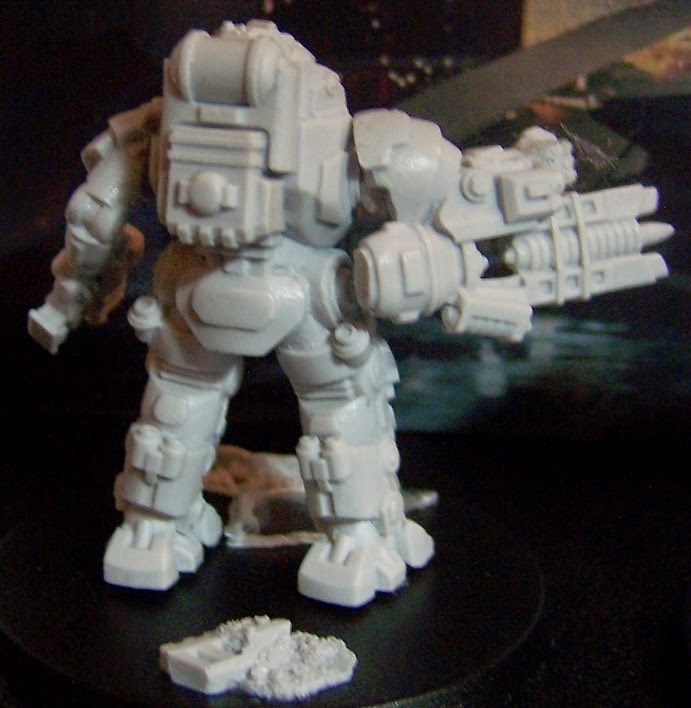 The model comes in six pieces; body, arms, weapon mount and two head options. 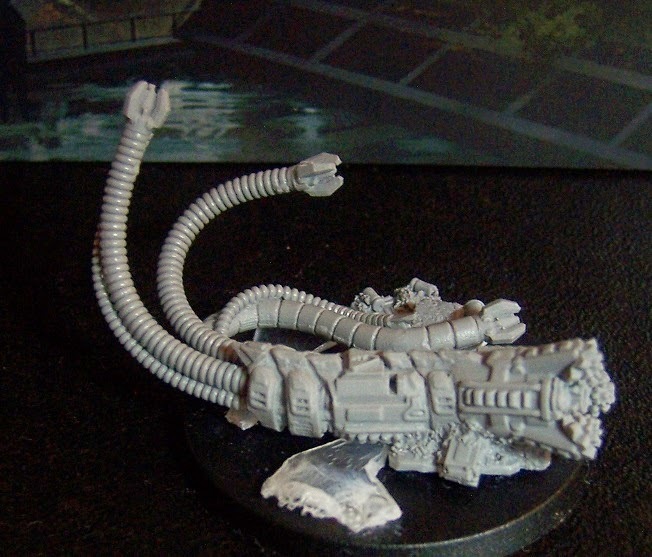 This does mean that it isn't quite so easy to give the model a different pose, at the same time some strategical cutting and use of warm water can work wonders with resin. I can't wait to find out how this beast of a machine will function in the game, it certainly freaks me the hell out already! 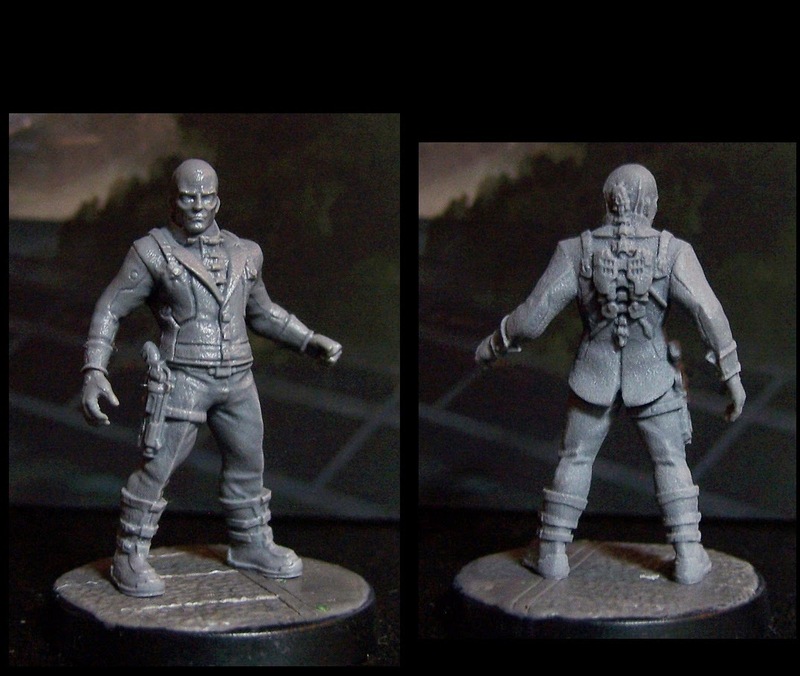 Added to the Kickstarter as an extra model as a thank you and to compensate for the few weeks of delivery delay we ran into, something which is a rather common thing with crowd-funding. So I was rather surprized and happy to see this fine gentleman taking to the battlefield. Turns out his daughter will be joining him in the future as well, rather cool to see such 'high importance' characters in the background being playable models. 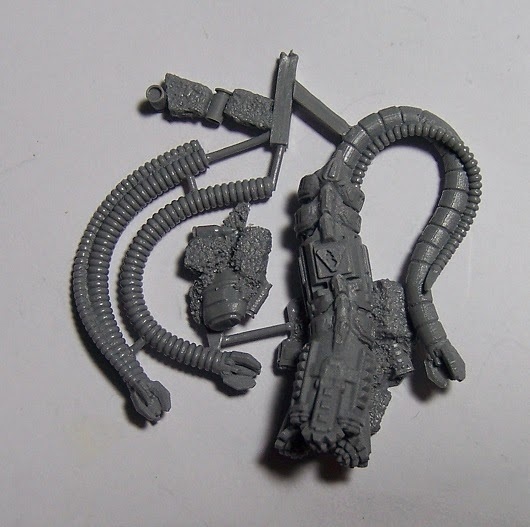 All in all I think we have another great line of resin, scifi models on our hands here from Anvil Industry (shop link). And with a little bit of luck they'll even take to the field with their very own cool rules, there's definitely enough potential in the universe to make this quite a fun game. 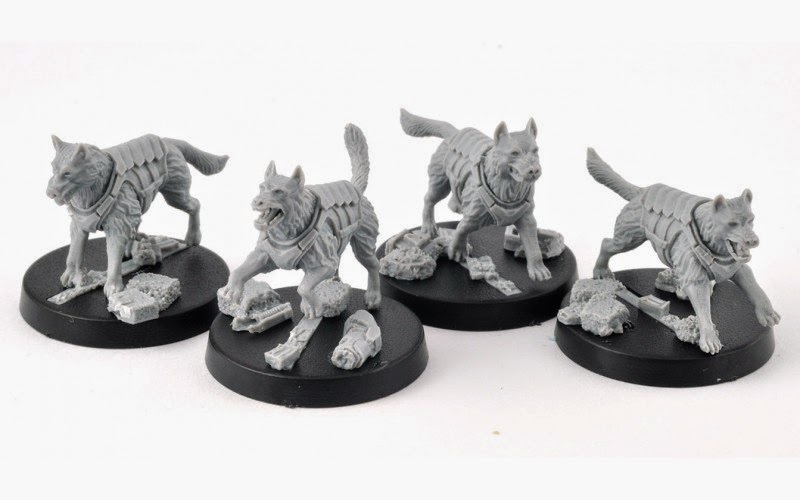 And lets be honest here, even if you 'only' add them to another game, these will look great on any tabletop! * Unit descriptions courtesy of Anvil Industry.